A collection of organ voluntaries with a solemn tone, suitable for sombre services like funerals and remembrance, but also containing some great tunes. The album includes 22 pieces, providing over 70 minutes of music and including Finlandia, Pavane pour une infante defunte, Handel’s Largo and Panis Angelicus. 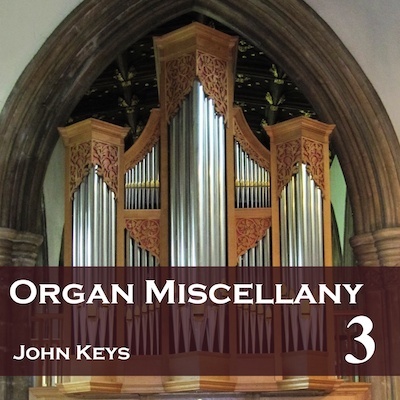 The download version is known as Organ Miscellany 3. The CD can be bought here. Alternatively, you can drop us an email at info@cul.co.uk with your order requirements and we will send back an invoice with the bank details to make a bank transfer, or send a cheque for the appropriate amount made out to Creativity Unleashed Limited to Creativity Unleashed Limited, 31 Eastbury Way, Swindon SN25 2EL, or buy using a card over the phone on 0117-230-7123 (Cheques and purchases over the phone in pounds sterling drawn on UK bank accounts only).